My name is Paula Darnell, and making silk flowers is my game. 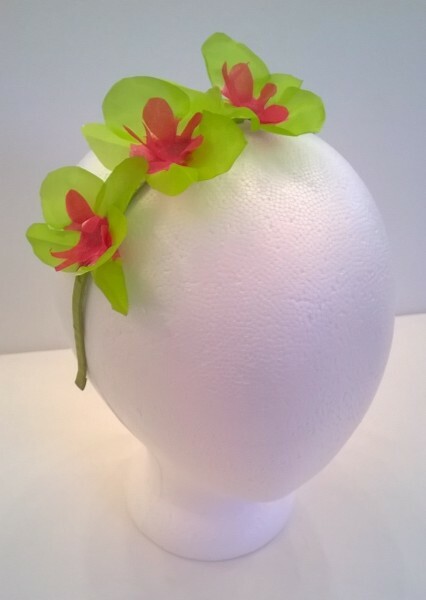 As a former fashion design instructor, my primary interest has been in accessories, and I started my jewelry business with beaded jewelry, then became interested in leather jewelry, and finally silk flowers, which I love because silk flowers can be used as brooches, hair clips, and fascinator or hat embellishments. For years, I've collected vintage fashion accessories, especially jewelry, hats, and purses. With so many wonderful floral motifs on these vintage items, it's easy to find inspiration from my vintage collection, but my primary source of inspiration comes from real flowers. Although these beauties are delicate and ephemeral, nothing beats the real thing. Natural flowers don't last long, but silk flowers do, and their many shapes and colors make them great fashion accessories. My process includes studying a real flower, or, if a real flower isn't available, numerous images of it. Then I decide whether to make a realistic flower or a fantasy flower by enhancing the center with beads or pearls. Next, I make petal templates, stiffen the silk fabric, dye it, cut out the petals, shape the petals with heated European flower-making tools, assemble the flower, and attach the metal finding to the back if it's going to be a brooch or a hair clip. If not, I'm ready to sew the flower onto a choker, fascinator, or hat. Dharma products I use include green label Jacquard Silk Colors, Jacquard Permanent Dyeset Concentrate, FabricMate Dye Ink Markers, and silk 10mm habotai fabric. The silk colors are very easy to use, and I can paint them on or dip them in the dye. I like that they can be thinned with water to make tints because many of the flowers I make feature pastel hues. The fine-tip markers come in handy when I'm drawing lines on silk orchids.